Suzanne is a woman on a mission. And that mission is all about impact. For over 20 years Suzanne has committed herself to helping non-profit organizations successfully achieve mission delivery; improving lives around the world from Africa to Haiti to right here in Boston. Suzanne’s passion and diverse fundraising, marketing, and communication expertise benefits each of her clients, including: The Clayton Christensen Institute, Colby College, Fitchburg State University, Huntington Theatre, and Museum of Arts and Design. Suzanne brings a unique blend of analytic discipline and creativity that both educates and inspires our clients and our own team. 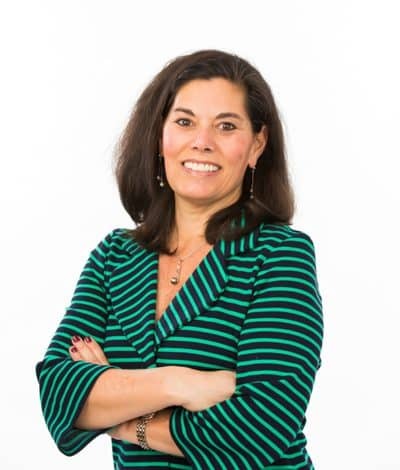 Prior to joining Development Guild DDI, Suzanne served as Vice President of External Affairs and Advancement at The Greater Boston Food Bank where she was a member of the senior leadership team overseeing all aspects of development, marketing, and communications. In this role, Suzanne worked with the CEO and Board on setting the strategic direction of the organization, doubling revenue during her tenure, and also led a complete re-branding initiative that resulted in a 20% increase in funds raised. Her previous work also includes serving as Director of Development at Partners in Health where she built a high performing development team growing revenue from $26 million in 2008 to over $80 million in 2010, including over $50 million for Haiti earthquake relief efforts. In addition, Suzanne was Executive Director of the Harvard College Fund where she managed a team of 40 that consistently exceed its fundraising goals. Earlier in her career, Suzanne worked for 10 years at Putnam Investments where she held several leadership roles the last one being Senior Vice President, Director, Marketing Strategy. Suzanne earned her undergraduate degree at Colby College and a Master of Business Administration from Harvard Business School. A committed alum, she currently serves as the Vice Chair of the Colby Fund Committee, a member of the Campaign Cabinet. and a Harvard Business School Women’s Association member. Outside of work, Suzanne enjoys being with family and friends, traveling, and spending as much time in Maine as possible.